The Apple MF886HN/A 27-inch iMac with Retina 5K display features 27-inch Retina display with IPS technology,Apple iMac Store Jaipur Sell The iMac With 3.5 GHz Intel core i5 quad core processor, 8GB 1600MHz DDR3 memory, 1TB Fusion drive storage, AMD Radeon R9 M290X graphics processor, Apple wireless keyboard, magic mouse, Wi-Fi & Bluetooth connectivity and runs on X Yosemite operating system. Apple iMac Store Jaipur iMac has always been about having a huge, immersive place to see and create amazing things. So making the best possible iMac meant making the best possible display. The new 27‑inch iMac with Retina 5K display has four times as many pixels as the standard 27‑inch iMac display. So you experience unbelievable detail. On an unbelievable scale. At such a scale, even the best existing technologies wouldn’t have made this iMac possible. So we did the impossible – developing a display with the performance to light up 14.7 million pixels, reducing energy consumption while maintaining our high standard for brightness, and advancing image quality for the most striking contrast ever. And we did it all without compromising the incredibly thin design, just 5 mm at its edge. The new iMac with Retina 5K display doesn’t stop with an amazing screen. With a quad-core Intel Core processor available at up to 4.0GHz, the latest AMD graphics, an advanced Fusion Drive, and Thunderbolt 2, there’s a very powerful Mac behind all those pixels. 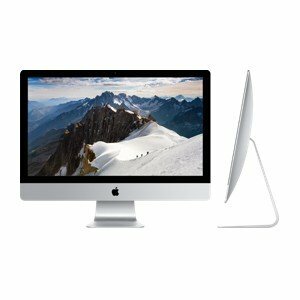 The Apple MF886HN/A 27-inch iMac features 3.5 GHz Intel Core i5 processor based on the ground-breaking Haswell ULT architecture that gives your iMac the power you need to finish the task at hand. This quad-core Intel Core i5 with Turbo Boost speeds up to 3.9 GHz comes as standard. The AMD Radeon R9 M290X graphics processor with 2GB of GDDR5 memory gives you advanced graphics performance. So when you’re trying to level up in your favourite game, or taking on other graphics-intensive tasks, things move more smoothly and with greater detail. It has 1TB of fusion drive storage that gives you the best of both worlds, a high-capacity hard drive and high-performance flash storage. It automatically manages your data so that frequently used apps, documents, photos and other files stay on the faster flash storage, while rarely used items move to the hard drive. So as a result, you get your Apps launch quickly, files and documents open faster than ever before. It comes with 8GB (two 4GB) of 1600MHz DDR3 memory. When combined with powerful processors and fast storage you can run more memory-intensive applications at the same time without compromising performance. It has stereo speakers, dual microphones and a headphone port.